The great thing about the pirate theme is that it never gets old. Every kid goes through the phase of "I wanna be a fearsome pirate." Some of us revert to that stage every September 19 for Talk Like A Pirate Day. Jack Sparrow, I blame you, though it was happening long before you came along. 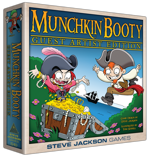 At any rate, Munchkin had to get a pirate game - and in 2008, it did. Lots of accumulated booty (arrr) later, it seemed time for a bigger ship. 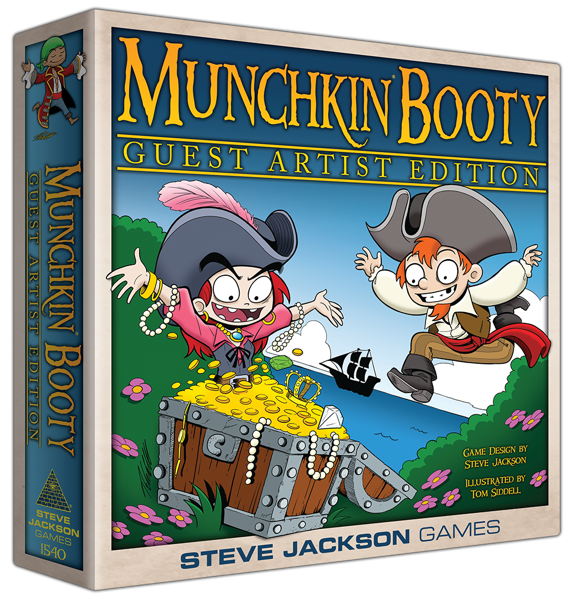 So we've reissued Munchkin Booty in the deluxe Guest Artist Edition format, with illustrations by Tom Siddell (Gunnerkrigg Court). I really enjoyed working on the original Booty project; it's one of my favorites to play . . . and not just because I get to talk like a pirate. I thought at the time that I was getting every single stupid nautical joke out of my system. As it turned out, not really . . . we did an expansion, Jump the Shark (2009), and then a mini-expansion, Fish & Ships (2010). Will there be more? It might be time, and I won't pretend we haven't talked about it. Booty is still very popular, and the bad ideas keep cropping up and we keep writing them down. Arrrr.